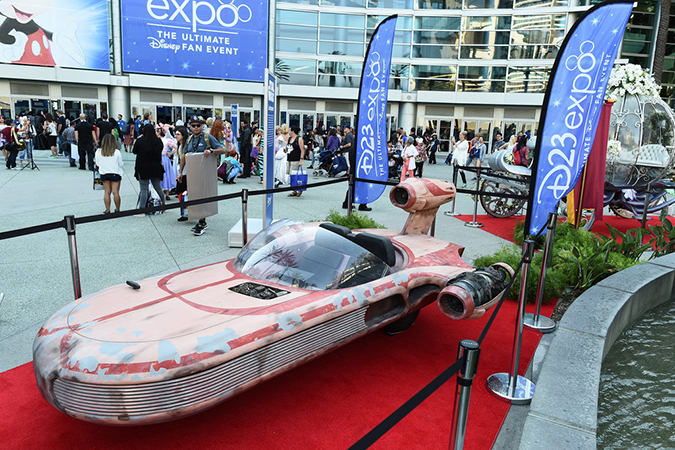 All the magic and excitement of the past, present, and future of Disney entertainment will come together once again when D23: The Official Disney Fan Club presents D23 Expo 2019 at the Anaheim Convention Center the weekend of August 23–25. Each of Disney’s magical worlds—including Pixar, Marvel, and Star Wars—will unite under one roof to celebrate what’s new and what’s on the horizon from Disney theme parks, television, music, products, and films. D23 Expo 2019 will feature a massive show floor full of immersive experiences and special opportunities to see what’s next for Disney around the world—and guests may run into their favorite Disney stars, characters, Imagineers, animators, and filmmakers. Guests can enjoy numerous shopping opportunities with D23 Expo-exclusive collectibles and more at an assortment of Disney and partner merchants, including the D23 Expo Emporium, where Disney fans can buy, sell, and trade Disney collectibles, memorabilia, merchandise, and more. All of the popular presentation venues will return, including Hall D23, the Expo Arena, Stage 28, and Center Stage. D23’s sixth Expo follows the success of D23 Expo 2017, which drew tens of thousands of Disney fans for three star-studded days and nights. Guests were treated to appearances by such celebrities as Oprah Winfrey, Reese Witherspoon, Whoopi Goldberg, Jordan Fisher, Robert Downey Jr., Mark Hamill, Kristen Bell, Chris Hemsworth, Mandy Moore, and the stars of Disney’s Descendants. Guests had the chance to take a jump into a life-sized DuckTales money bin; were the first to see a full-scale model of Galaxy’s Edge, the Star Wars-themed land coming to Disneyland and Walt Disney World Resorts; and were able to enjoy a full-length concert from Disney Legend Alan Menken. They also enjoyed a look back at Disney’s rich history through extraordinary panels, presentations, and exhibits and discovered the newest entertainment, technology, and products coming from Disney. Tickets for D23 Expo 2019 will go on sale at D23expo.com beginning August 23, 2018. Special pricing on both one- and three-day tickets to the event—including an Early Bird Discount—will be exclusively available to D23 Gold Members. Additional special benefits will also be available to D23 Gold and Charter Members at the 2019 Expo. D23 Gold Members will also have an opportunity to purchase the Sorcerer Package, which provides a host of special benefits and amenities. Ticket prices will be announced later this summer. D23 Expo—The Ultimate Disney Fan Event—brings together all the worlds of Disney under one roof for three packed days of presentations, pavilions, experiences, concerts, sneak peeks, shopping, and more. The event provides fans with unprecedented access to Disney films, television, products, theme parks, and celebrities. Presentations, talent, and schedules are subject to change. For the latest D23 Expo news, visit D23expo.com. To join the D23 Expo conversation, make sure to follow @DisneyD23 on Twitter and use #D23Expo. The name “D23” pays homage to the exciting journey that began in 1923 when Walt Disney opened his first studio in Hollywood. D23 is the first official club for fans in Disney’s 90-plus-year history. It gives its members a greater connection to the entire world of Disney with member-exclusive discounts; a collectible annual member gift; special events around the country; its quarterly publication, Disney twenty-three; a member-exclusive website at D23.com; and access to the latest breaking Disney news and exciting opportunities throughout the year. Fans can join D23 at Gold Membership ($74.99), Gold Family Membership ($99.99), and General Membership (complimentary) levels at D23.com and at shopDisney.com/D23. To keep up with all the latest D23 news and events, follow DisneyD23 on Twitter, Facebook, Instagram, and YouTube.